Tens of billions of dollars are lost every year by U.S. Banks (1) and as much as 20% of unsecured bad debt at leading U.S. and European banks is actually first-party fraud (2). 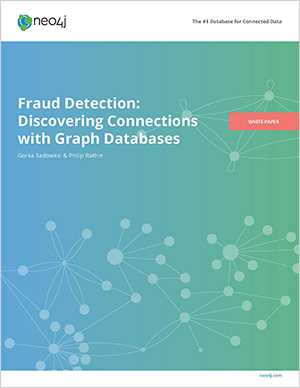 Graph databases offer new methods of uncovering fraud rings and other sophisticated scams with incredibly high accuracy, so your company can stop advanced fraud scenarios in real time. Graph databases provide enhanced insight based on data relationships, to you can develop next-generation fraud detection systems based on connected intelligence. Gorka Sadowski has spent the last 20 years in CyberSecurity building safer and better computing environments. From invention to innovation to product, he has defined, influenced, evangelized, and brought to market many Technology and Security solutions and services to the Industry. Philip Rathle, VP of Products, Neo4j, has a passion for building great products that help users solve tomorrow's challenges. He spent the first decade of his career building information solutions for some of the world’s largest companies: first with Accenture, and then at Tanning Technology, one of the world's top database consultancies of the time, as a solution architect focusing on data warehousing and BI strategy.